Darjeeling: St. Joseph's School, Darjeeling popular as North Point opened its gates for children from the weaker sections of society with the flagging off of the month-long unique free winter camp from Tuesday. The school was founded on February 13, 1888 at Sunny Banks in Darjeeling town with 18 boarders and seven day scholars. Later extensive property was procured by Father Henri Depelchin, the founder and the school shifted to its present location at North Point on February 18, 1892. Father Depelchin was instrumental in founding St. Xavier's Kolkata and Mumbai. The children have been given books, stationary, lunch and all the facilities the school has to offer. The students come from nearby areas and also from far-flung tea gardens. The first day saw around 250 registrations. "The numbers will go up within a week. Last year we had more than 500 students attending. We are trying to improve the camp with every passing year so that children get a better experience. This year, the kids will be trained in different fields and will also be given certificates for the courses they attend," added the Rector. The children are encouraged to communicate in English so that their vocabulary increases. Elocution is conducted in each class as well. Imbibing them with moral values is the main focus. Along with the teaching-learning process, this year the kids will be trained in cursive writing, yoga, Zumba, dramatics, singing, dancing, origami, philately, numismatic and football. "Last year also I had attended the winter camp. I love to take part in dance classes," stated Ananya Tamang, a Class VI student from Singtom tea estate. The entire North Point family including teachers, students and the alumni take active part in the camp. Even funds for running the camp is collected by the students of St. Joseph's School through raffle sheets and other fund raising programmes. This unique programme was started in 2007 by the then Rector Father Kinley. This year, the Darjeeling North Point School Alumni Association donated an ambulance to Hayden Hall named the Late Father Van memorial ambulance service. "Patients come to Darjeeling from far-flung areas and are referred from the Hill town to the plains. At times there is a dearth of ambulance services. This will help people in times of need," stated Deven Gurung, president of the Alumni Association. 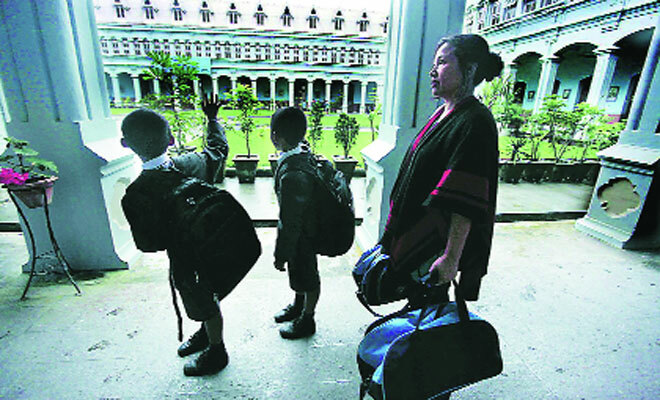 The Hayden Hall is run by Jesuits in Darjeeling and takes part in numerous outreach programmes. "It is a noble gesture on part of the alumni and we will try our best to serve the purpose of benefitting society specially the marginalised," remarked Father Paul D'souza, director, Hayden Hall. Joyoshi Das Gupta, the District Magistrate, Darjeeling, was present as the chief guest.